KATHMANDU, June 17: The results of the Secondary Education Examinations (SEE) were published on Friday. Out of the total examinees of Grade 10 in the seven provinces, girls outnumbered boys in five provinces. 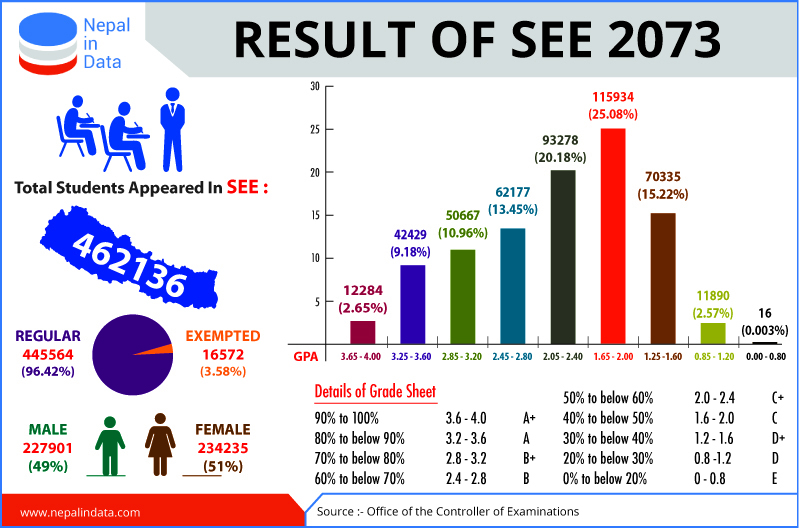 A total of 462,136 students had appeared in the SEE examinations. Out of total students registered for the exams, 445,564 were regular students and 16,572 exempted students. 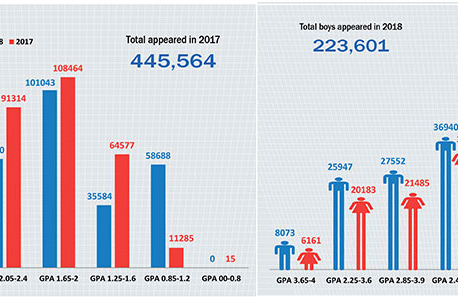 Examinations controller Ambika Regmi informed that 4,284 students in the regular category achieved results in the Grade Point Average (GPA) range of 3.65 to 4. Similarly, 42,427 students achieved results in the GPA ranging from 3.25 to 3.60, 50, 646 in the range of 2.85 to 3.02, 61,955 in the range of 2.45 to 2.80, 91,314 in the range of 2.5 to 2.40 and 108,464 in the GPA range of 1.65 to 2.00. A total of 64, 577 students achieved results in the GPA range of 1.25 to 1.60. The highest number of examinees attended the SEE from Province 3. The province had 105,018 students including 53,140 boys and 51,878 girls, according to the Office of the Controller of Examinations (OCE). Likewise, the numbers of boys and girls in Province 1 were 35,598 and 39,179 respectively, and 33,393 and 29,085 in Province 2. Similarly, 23,674 boys and 24,163 girls had appeared in the exams from Province 4, and 35,891 boys and 37,041 girls had sat for the exams from Province 5. Likewise, the numbers of boys and girls in Province 6 were 16,094 and 17,100 respectively, and 23,892 and 25,436 in Province 7. According to the National Examination Board (NEB), a total of 483,967 students including those from technical groups were registered to sit for the SEE but 11,825 were disqualified due to insufficient attendance while 10,006 were absent in the exams. This is the second time the letter grading evaluation system is practiced in SEE. Individual subjects have been graded under alphabetical letter grading (E to A+) while aggregation has been graded in numerical GPA (Grade Point Average) ranging from 0.8 to 4.0. No students will be placed under failed category but those students who have obtained up to C or 2.0 GPA in their exams or in an individual subject can sit for supplementary exams for upgrading their marks. “The supplementary exams for such students will be held from July 31 to August 10,” said Regmi. “The students who missed up to two subject examinations will be allowed to sit for supplementary exams,” he added. The SEE for Grade 10, which was called School Leaving Certificate (SLC) exams in the past, concluded on March 24. The exams were conducted in 1,923 exam centers from March 16-24. 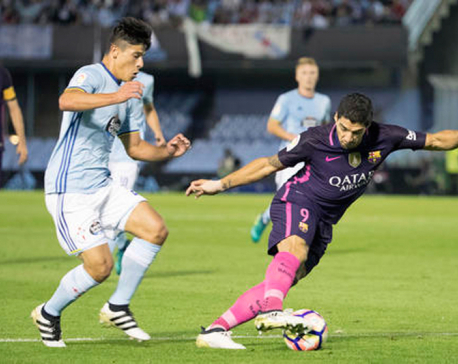 However, the SEE for technical groups had concluded on March 27. Grade 11 classes will begin in July as usual with choice of different streams, according to NEB officials. This is the first time Grade 10 exams were held at regional/provincial level after the implementation of the eighth amendment of Education Act about a year ago. The Education Act has provisioned the SLC exams to be held in Grade 12 as the School Leaving Certificate Examination (SLCE). The Act has enshrined the provision of taking exams in Grade 8 from districts, in Grade 10 from region/province and in Grade 12 from national board.